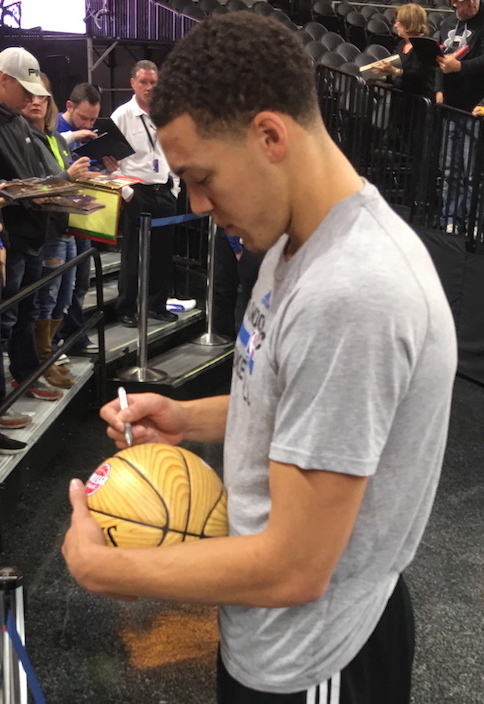 Lance Martinez at My Detroit Sports provides this photo of Orlando Magic high-flyer Aaron Gordon signing autographs at The Palace of Auburn Hills. After being selected with the fourth pick in the 2014 NBA Draft, the Arizona alum emerged on the national scene thanks to an epic slam dunk contest battle with the now two-time defending champion Zach LaVine. Though many observers believe that Gordon should have been awarded the dunk title, there is no question that the San Jose native made a huge name for himself last February in Toronto. This season, the 21-year-old forward is averaging 11.0 points, 4.4 rebounds and 1.7 assists per game. Now in his third campaign, Gordon has increased his scoring average from 5.2 in his rookie season, to 9.9 in his second year, up to 11.0 in 2016-17. The former Pac-12 Freshman of the Year is proving to be more than just a dunker. Orlando sports fans can check out numerous other iFolloSports.com articles, chronicling the sports scene in the Central Florida area.